In my family we have had many things to celebrate so far this year. My husband blew out his hip running marathons warming up with half-marathons — and in January he received a new titanium, plastic, and ceramic hip. In July our younger daughter started at the only graduate school she applied to — at night — as she enters her second year teaching 5th grade. In September ruzowgraphics won 9 American Graphic Design awards on behalf of our clients. And the topper of our year was our older daughter marrying the man of her dreams in a beautifully branded, designed, table-scaped, food-coma inducing wedding we should really call — the event. NEXT ON THE DOCKETS OF MANY AMERICANS is the love/hate relationship with Halloween. If you are one of the lucky ones to receive our Halloween promotions, expect yours in the mail before the big day. If not, let us know if you would like to receive one. THEN COME THE BIG ONES: Thanksgiving, Chanukah, and Christmas. We have a huge celebration with many relations at my brother’s house for Thanksgiving. The food fest ends with a pie baking contest, where women are not allowed to bake — we only judge — and we are positively ruthless when it comes to our likes and dislikes. My niece gives out awards for the pies and the Better Luck Next Year award is the dreaded one. For Chanukah we gather by FaceTime on our Macs to light our candles and sing “on this night, we shall light” with our kids in their homes. We try to keep the tradition alive by getting together with the kids of our family and my brother’s family and exchanging gifts, and eating bagels, fish, and cucumbers. And then there is Christmas. I inherited Christmas when I married my Cuban-born husband. What Jewish kid did not envy the Christmas tree all her friends had growing up? While we still honored my parents’ tradition of Chinese food on Christmas Day, I learned to cook a Cuban feast for Noche Buena (Christmas Eve). This year my husband and our new son-in-law will be roasting a pig on a spit. Kinda grosses me out — but hey — boys gotta play. WITH ALL OF THESE HOLIDAYS I LIKE TO CELEBRATE WITH BEAUTIFULLY COORDINATED GRAPHICS — napkins, candles, plates, wrapping paper, invitations, and the like. 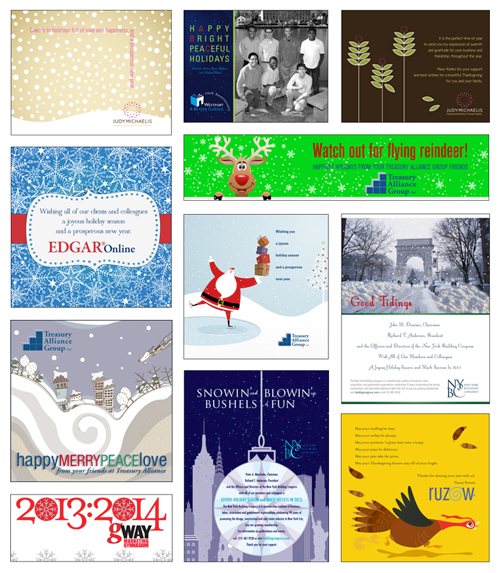 Over the past few years I have designed many holiday cards — take a look and let me know what you think. HOPE YOUR CELEBRATIONS ARE FUN!